St. Cyril of Jerusalem was Bishop of Jerusalem and Doctor of the Church. He was born about 315; died probably March 18, 386. In the East his feast is observed on the 18th of March, in the West on the 18th or 20th. Little is known of his life. We gather information concerning him from his younger contemporaries, Epiphanius, Jerome, and Rufinus, as well as from the fifth-century historians, Socrates, Sozomen and Theodoret. Cyril himself gives us the date of his "Catecheses" as fully seventy years after the Emperor Probus, that is about 347, if he is exact. Constans (d. 350) was then still alive. Mader thinks Cyril was already bishop, but it is usually held that he was at this date only as a priest. St. Jerome relates (Chron. ad ann. 352) that Cyril had been ordained priest by St. Maximus, his predecessor, after whose death the episcopate was promised to Cyril by the metropolitan, Acacius of Caesarea, and the other Arian bishops, on condition that he should repudiate the ordination he had received from Maximus. He consented to minister as deacon only, and was rewarded for this impiety with the see. Maximus had consecrated Heraclius to succeed himself, but Cyril, by various frauds, degraded Heraclius to the priesthood. So says St. Jerome; but Socrates relates that Acacius drove out St. Maximus and substituted St. Cyril. A quarrel soon broke out between Cyril and Acacius, apparently on a question of precedence or jurisdiction. At Nicaea the metropolitan rights of Caesarea had been guarded, while a special dignity had been granted to Jerusalem. Yet St. Maximus had held a synod and had ordained bishops. This may have been as much as the cause of Acacius' enmity to him as his attachment to the Nicene formula. On the other hand, Cyril's correct Christology may have been the real though veiled ground of the hostility of Acacius to him. At all events, in 357 Acacius caused Cyril to be exiled on the charge of selling church furniture during a famine. Cyril took refuge with Silvanus, Bishop of Taraus. He appeared at the Council of Seleucia in 359, in which the Semi-Arian party was triumphant. Acacius was deposed and St. Cyril seems to have returned to his see. But the emperor was displeased at the turn of events, and, in 360, Cyril and other moderates were again driven out, and only returned at the accession of Julian in 361. In 367 a decree of Valens banished all the bishops who had been restored by Julian, and Cyril remained in exile until the death of the persecutor in 378. In 380, St. Gregory of Nyssa came to Jerusalem on the recommendation of a council held at Antioch in the preceding year. He found the Faith in accord with the truth, but the city a prey to parties and corrupt in morals. St. Cyril attended the great Council of Constantinople in 381, at which Theodosius had ordered the Nicene faith, now a law of the empire, to be promulgated. St. Cyril then formally accepted the homoousion; Socrates and Sozomen call this an act of repentance. Socrates gives 385 for St. Cyril's death, but St. Jerome tells us that St. Cyril lived eight years under Theodosius, that is, from January 379. St. Cyril's teaching about the Blessed Sacrament is of the first importance, for he was speaking freely, untrammelled by the "discipline of the secret". On the Real Presence he is unambiguous: "Since He Himself has declared and said of the bread: This is My Body, who shall dare to doubt any more? And when He asserts and says: This is My Blood, who shall ever hesitate and say it is not His Blood?" Of the Transformation, he argues, if Christ could change water into wine, can He not change wine into His own Blood? The bread and wine are symbols: "In the type of bread is given thee the Body, in the type of wine the Blood is given thee"; but they do not remain in their original condition, they have been changed, though the senses cannot tell us this: "Do not think it mere bread and wine, for it is the Body and Blood of Christ, according to the Lord's declaration". "Having learned this and being assured of it, that appears to be bread is not bread, though perceived by the taste, but the Body of Christ, and what appears to be wine is not wine, though the taste says so, but the Blood of Christ . . . strengthen thy heart, partaking of it as spiritual (food), and rejoice the face of thy soul". It is difficult not to see the whole doctrine of Transubstantiation in these explicit words. Confirmation is with blessed chrism: "As the bread of the Eucharist after the invocation of the Holy Ghost is not bread, but the Body of Christ, so this holy myrrh is no longer simple, as one might say, after the invocation, but a gift of Christ and capable by the presence of the Holy Ghost of giving His divinity" (ii, 4). St. Peter and St. Paul went to Rome, the heads (prostatai) of the Church. Peter is ho koryphaiotatos kai protostates ton apostolon. The Faith is to be proved out of Holy Scripture. 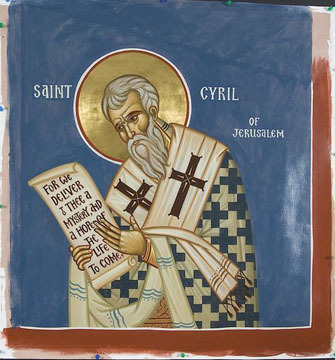 St. Cyril, as the Greek Fathers generally, gives the Hebrew canon of the Old Testament omitting the deutero-canonical books. But yet he often quotes them as Scripture. In the New Testament he does not acknowledge the Apocalypse. as to have life ever more abundantly.